One of the highlights of a visit to New Orleans is sampling the wide variety of cuisine and dining options on offer, with many of the world's best chefs working here in the countless restaurants, cafés and general New Orleans eateries. Cajun cooking is famous the world over and many Cajuns have moved into the city of New Orleans to take advantage of this reputation. 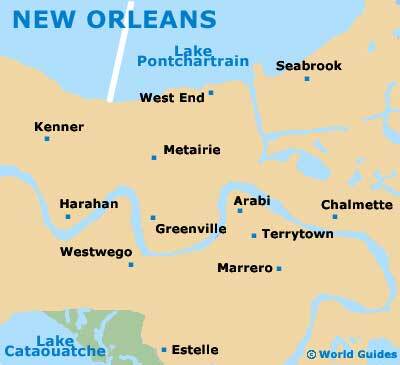 New Orleans is also one of the best places in the US for authentic French cuisine and dining, while a bewildering array of other international restaurants are on offer. 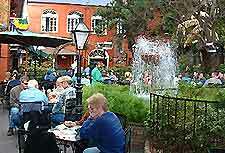 Restaurants are concentrated in the French Quarter of New Orleans, the main tourist center, especially along Bourbon Street (which never closes) and around Jackson Square, including the French Market. The Warehouse District, the city's arts precinct, is home to countless cafés catering to the bohemian crowd, as well as diners catering to the business crowd, as this is also the city's Central Business District (CBD). 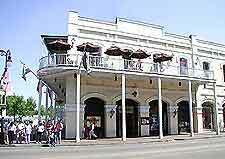 The Uptown district and University area of New Orleans also boast numerous cafés popular among students. It's possible to find a bite to eat at any time of the day or night in New Orleans. If you are looking for establishments that open 24 hours, the best bet is Bourbon Street which is lined with eateries, cafés and diners catering for partygoers. Café Du Monde is a New Orleans institution, located on Jackson Square and open 24 hours. Many cafés and diners serve all day breakfasts, while Uptown and the Central Business District (CBD) are popular for inexpensive lunches and lunch-only eateries. Bourbon Street is without a doubt the place to head for bars, cocktail lounges, stylish restaurants and clubs in New Orleans. Crowds flock here from all over the world to sample the city's famed nightlife and you can rest assured that Bourbon Street is where the party never stops. Jazz clubs in communities surrounding the French Quarter of New Orleans offer a more authentic and less commercial experience, while the University area is also home to numerous music venues and a young, vibrant crowd. Most visitors to New Orleans will descend on the French Quarter for breakfast, which contains plenty of cafés and restaurants offering traditional surroundings, exotic food and chic crowds. Sunday brunch is particularly popular, with many eateries offering live jazz performances, making it a quintessential New Orleans experience. A more straightforward option is to make your way to one of the many diners found in the New Orleans Central Business District (CBD) or along Bourbon Street. There are numerous establishments located in the Central Business District (CBD) catering for the business crowd, while Uptown New Orleans caters largely for the student population, offering great food at good prices, with quick service and pleasant surroundings. 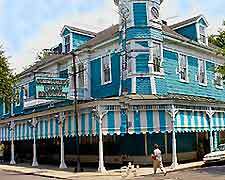 You will find plenty of restaurants serving delicious Cajun and Creole food in the French Quarter, set in elegant surroundings with most open for dinner as well as lunch. Dinner is when New Orleans restaurants really shine and again the French Quarter offers the largest variety and concentration of restaurants for visitors. Seafood dishes are especially popular in New Orleans restaurants, as are Italian, Cajun and Creole dishes. Locals pride themselves on their food and it is hard to find a mediocre dish in the whole city of New Orleans, so it is best to decide what style you're after first and start from there. The Moonlit views of the Mississippi River as you are sampling fine food and wine are truly magical.